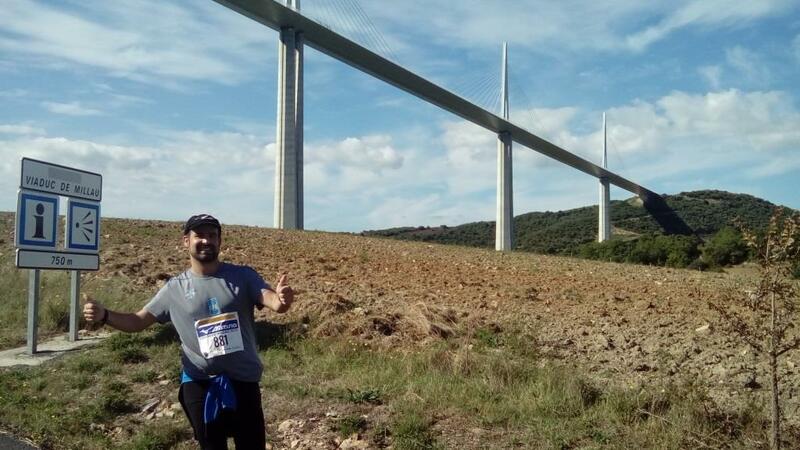 I had doubts I would ever put myself to the test of an ultra marathon or a 100km race again after having completed the “100km de Millau” in 2011. 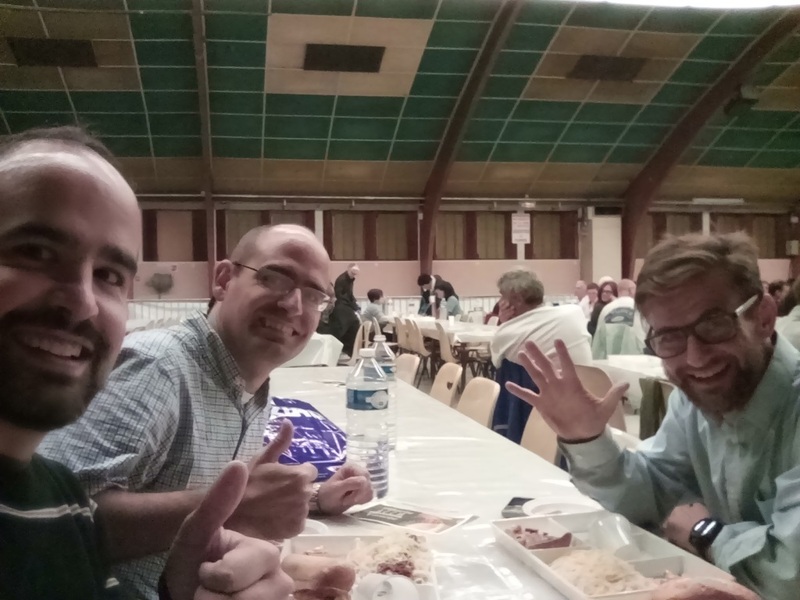 … a couple of months ago, Manuel mentioned that he would run Millau and asked whether I was interested. I passed on the baton to Jaime, who almost immediately said yes. And thus, we subscribed ourselves to the race. Running bibs the night before the race. Pasta dinner the night before the race. We didn’t specifically train for this race. Jaime didn’t almost find the time to train, except for the weekends. I took a look at some training plans and the amount of dedication required put me off. Thus, I decided to simply keep running a moderate mileage of between 40-60km per week on average and knowing that this would suffice to complete the marathon satisfactorily, go with that as training and rely on the mental side and experience for the rest. 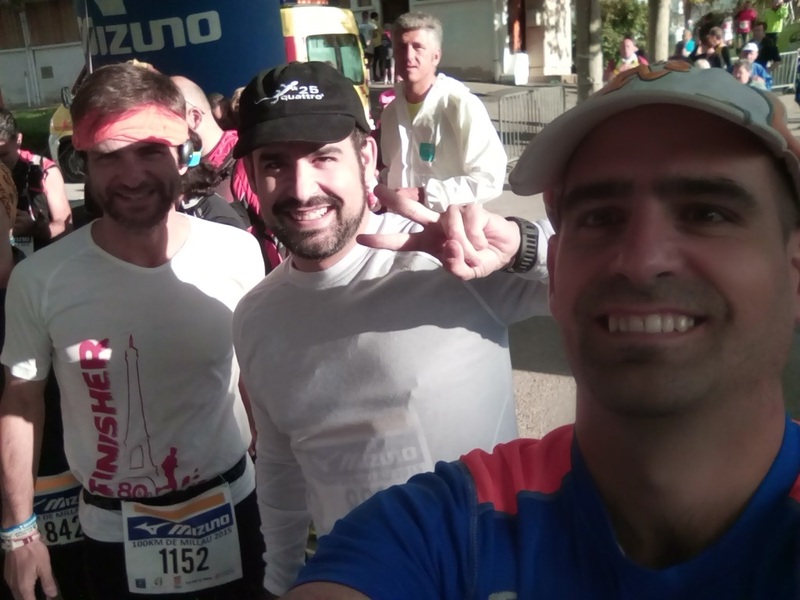 Our race strategy was rather simple this time: run a marathon in a ~6:20 pace, aiming at about 4h30′, stopping briefly in the supply posts, reduce at least in half the time spent changing clothes and shoes in Millau (km 42) and Sainte Affrique (km 71)… and so we did. We basically followed it to the point. Breakfast the day of te race. Leaving the hall towards the starting point. Which pacer do we follow? One last picture before we start running. We started running at the intended pace. We first catched the 13h pacer, the 12h pacer, the 11h30 pacer… we knew we wouldn’t arrive with them but wondered why we were overtaking them. We asked their estimated arrival time at the marathon and it was slower than ours (though they wouldn’t stop then and would keep a faster pace in the second 58km than what we intended). So, after about 10km we went forward with our 6’20″/km rhythm. When you see the profile of the complete race you may get the impression that the marathon runs along a flat profile. It certainly does not. There are some spots, especially right after the half marathon, which are very demanding. We took them easily even if kept running in them. At about the km 28, we softened the pace to avoid meeting the Wall. And so we did. Again, running this marathon at a leisure pace was a great experience. In the end we spent some 14 minutes longer than planned (~4h42′), but the timing was good enough. At Millau (km 42.195) we changed clothes, but kept the pause shorter than we did in 2011 (just less than 20′). Departing from Millau was difficult again: getting the muscles to work again after a little resting time. We needed to keep running for just about 5km until the first hard climb to pass under the viaduct. We did so. Even if I had some pain in the Achilles tendon when running uphill. At the viaduct we took again some pictures, plus another at the 50km mark, even if changed to a smaller one (in comparison to 4 years ago). Descending towards St. Georges Luzencon we took a conservative pace as we did at the beginning of the false flat course towards St. Rome de Cernon. However, after some minutes of soft climb I felt again pain in the Achilles tendon and I had to walk at some stretches combining it with running. Highest viaduct in the World, definitely worth a picture. At St. Rome, we took a quick preventive massage. Followed by a good supplies ingestion. Funny enough, just leaving the village, I was still eating some bread with foie gras and drinking (both hands occupied) when some spectators cross checked my bib number with the local newspaper, found my name and started cheering me! I found it funny: being cheered for eating and drinking :-). After St. Rome, it came the climb to Tiergues, which we walked up. In the descent from the top of the hill towards Tiergues itself (at km 65) we met Manuel who had some muscular troubles himself (but he nevertheless would finished in a very respectable time of 11h22′). After the supply post at Tiergues we continued running down to St. Affrique. We arrived there with some 40-50′ in advance in relation to the timing we did in 2011. And again, we kept the stop in St. Affrique to the minimum time needed for changing clothes, eating and drinking. Another 20′ and we went. Started running just to the outskirts of the village before starting the long(est) climb back to Tiergues, about 7km. At the top we were about 1h10′ ahead of the time we did in 2011. I remember one of the volunteers at Tiergues (ex km. 65, now km. 77) who was continuously making jokes to runners, very loudly, all other volunteers laughing with him. I told my brother that I wouldn’t have minded to stay there partying with them. However, after a few minutes of eating (some hot soup) and drinking (some beer) we re-started running to complete the uphill climb and the downhill descent back to St. Rome. Once you start the descent to St. Rome you know you have made it. You’re about a half marathon from it. 22km. In the (almost) worst of the cases you can slowly walk them to the end and it would take you a mere 5 extra hours… so what? But then you run and it takes half of it. At St. Rome I needed some attention from the podiatrist to heal a blister. It did more bad than good, as instead of just removing the liquid and drying it out, she introduced some other disinfectant liquid which kept the pressure and left me in pain for a couple of days. From St. Rome we had another gentle descent down to St. Georges. At mid-way point (Pont du Dourdou) there was the supply post in which the play rather loud and very animated music, a kind of discotheque. I would not have minded to stay there either for the remainder of the night. 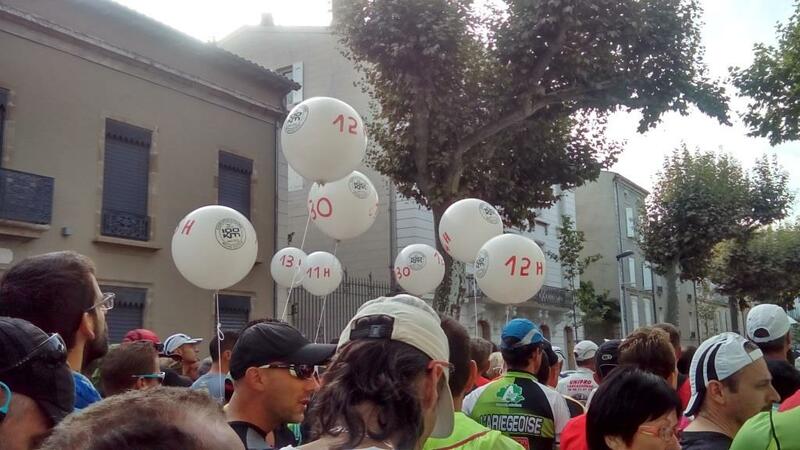 But we still had 15km to go. At the time I was already making numbers knowing that we wouldn’t finish under 14h but confident that we would under 15h. We kept running down to St. Georges where we stopped to take some more soup, coke… one more kilometer and up again to the viaduct, walking again. Once you run under the viaduct on the way back you’re less than 8km to go. It – is – done. At the descent down to Raujolles we noticed the sign post with the 8% descent (meaning that from km. 47 you had a nice 2km-long 8% climb!). By then we had been over taking runners and walkers for some time. Some of whom were not stopping at supply posts and would overtake us during those pauses. At Creissels we took the last bit of soup, chocolate and water. And there we went down to Millau. Again, to Millau. Millau. The bridge crossing the river Tarn in the entrance of the city is at about the 98th kilometer. 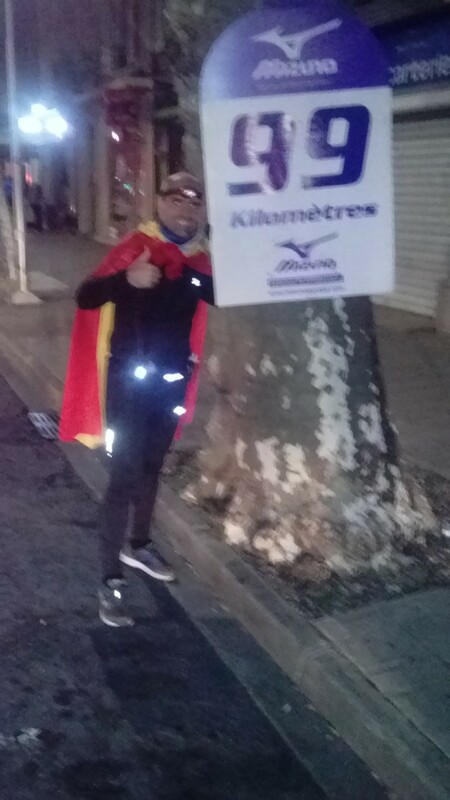 This time again, I put then on the Spanish flag to complete the last two kilometers with it. We again took some pictures at the emblematic sign post at the km. 99 in the streets of Millau. Posing by the km. 99 sign post. 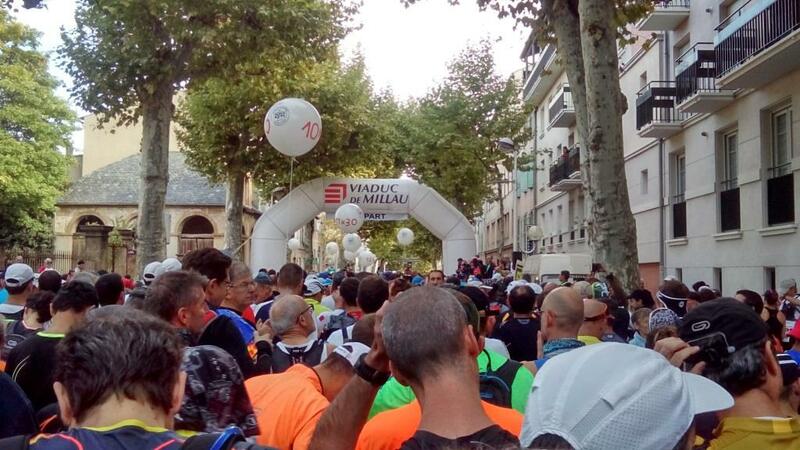 We kept running in the Avenue de la Republique afterwards called Charles de Gaulle, we then entered the Parc de la Victoire and again we sprinted to climb the metallic structure allowing us to enter into the Salle de fetes de Millau, crossing the finish line in 14h39’21”. Four years later, again, objective accomplished. 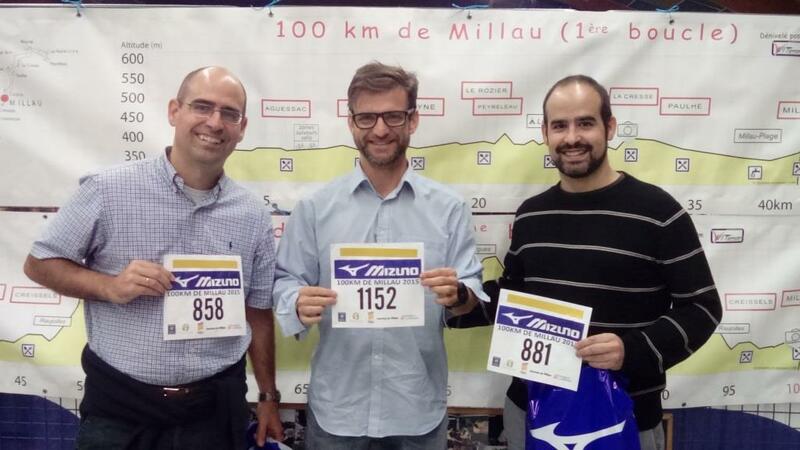 The 100km of Millau completed. 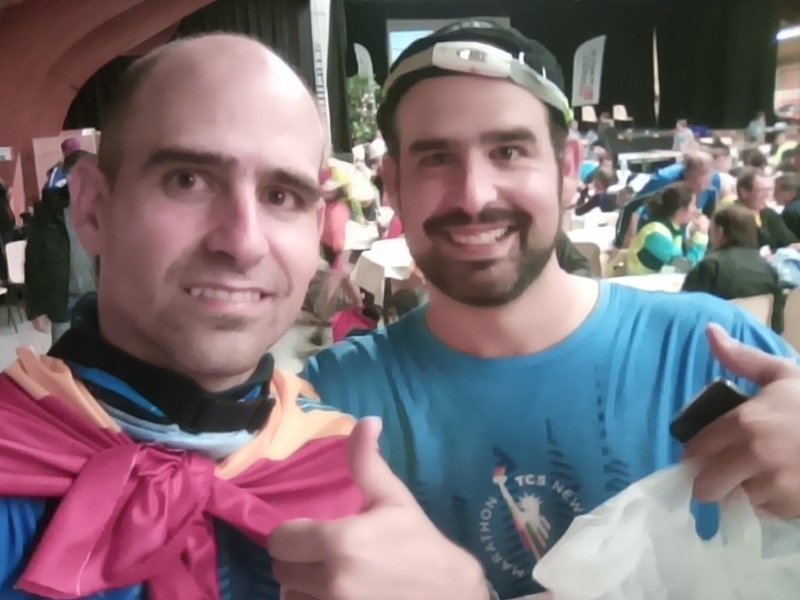 Another ultra marathon finished. This time we employed some 35′ less than the previous time. We basically reduced the time spent in long pauses, we ran a faster marathon and needed less medical assistance. 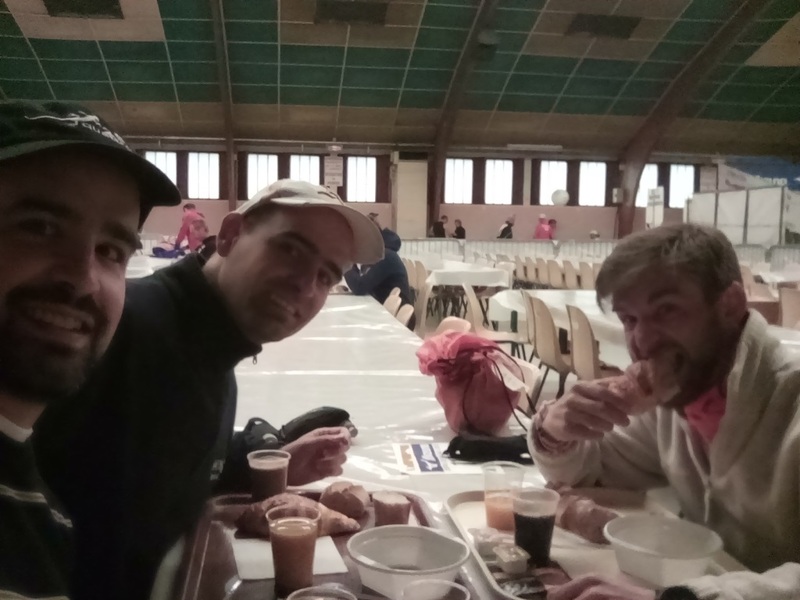 However, we ran slower the last 22km (we consumed there some 35′ more, or half of the time-cushion we had at Tiergues). This time, for me it was very much less mentally demanding. I remember that in 2011 I had many doubts at some points. If Jose had not been there, I may had dropped it between km 60 and 71. This time I didn’t have any doubt. I was cheering my brother and myself from km. 25 every now and then. Knowing that we would make it. Again, no matter the time. 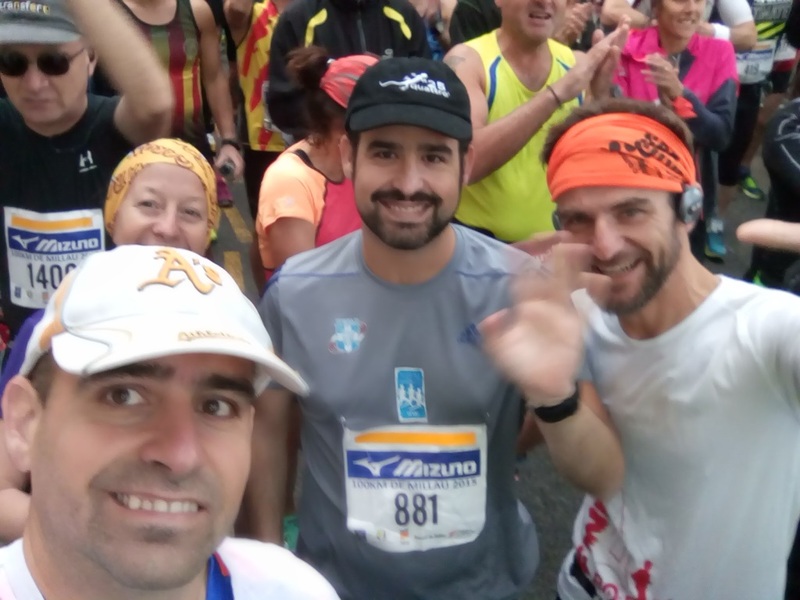 The following days, again, I had a terrible pain in the legs, similar to those you may have after the first marathon you run (especially if not well trained, as it was my case back in 2000). However, after a week I could start running and training again. A much better recovery than 4 years ago, when I suffered from a serious tendonitis. 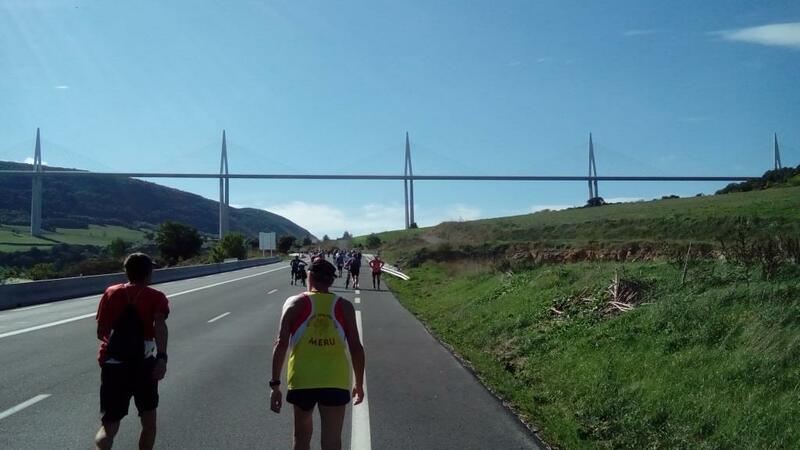 I don’t know if I will run another time in Millau, or even another ultra, but this time, yes, I felt comfortable with knowing that it was manageable and that if needed, it can be done yet another time. (1) It also helped that I had written a detailed post about it in this blog, to which I came back for references.